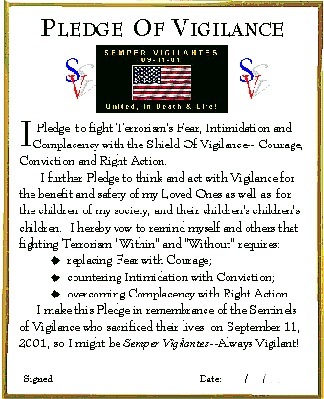 GROUND ZERO, New York City, Feb. 22--Vigilance, like Terrorism, comes in many forms. It can be glorious and free, requiring only that one "let themselves go" as 16-year-old Sarah Hughes did last night when she won the Gold Medal in women's figure skating at Salt Lake City. Or, it can present itself with a gun to your head as Michelle Kwan found when she fell during her final bid to garner a Gold Medal to cap off a career of figure skating excellence. Or, it can come with the Olympic dignity of a pregnant woman who refuses to crumble in the face of Terrorists slitting her husband's throat and videotaping the barbaric act. Yesterday was filled with human glory and human degradation. The battle at the Olympics was a drop in the bucket to the fortitude of young soon-to-be mother receiving news that her 38-year-old husband, Wall Street Journal reporter Daniel Pearl, had been brutally killed--executed--because the Terrorist's demands to release Pakistani detainees at Guantanamo Bay, Cuba had not been met. The relationship between the Vigilance of an Olympic Medal Battle and Terrorists killing a journalist may be a difficult stretch for some. To connect the two, the Terror of losing something precious must be illuminated. It doesn't take much description for one to recognize the terror a wife and family experience knowing a loved one is being held by Terrorists who so devalue life that killing is as effortless for them as spitting. One's imagination need not be pricked to visualize the endless days and nights of praying, worrying, and emotional numbness that Daniel Pearl's wife, Mariane, endured since January 23 when her husband was first abducted. Seeing pictures of him on television and in the newspapers with a Terrorist's gun to his head, and the global vow to kill him if demands were not met, must have torn at her soul and heart, shredding at the faith she clung to that she might once again see her husband alive, that the child growing in her womb might grow up with his presence rather than his memory. And then there was the crushing news that not only had "Danny" been killed, but his throat slit and the horror of it etched on video tape. The avalanche of despair and horror for Mariane Pear must have been immeasurable. In another part of the world, Michelle Kwan's Olympic Gold Medal dreams hung by a Terroristic thread. She was eager to win the Crown Jewel of skating. The Gold Medal that would cap her illustrious career eluded her. Terror ruled as she witnessed a 16-year-old give a stellar Gold Medal performance that brought the crowd to its feet as Sarah Hughes, a Long Island high school student, made Olympic ice skating history by performing a flawless and historic routine that left everyone's mouth hanging open. Kwan's competitive life revolved around winning a Gold Medal. It was her Holy Grail. She had won every other title and another teenager in Nagano four years earlier had squeezed past her for the Gold Medal. This was her swan song. Thunderous applause and tremendous scores for the young skater put a gun to Kwan's head. Terror doesn't have to last forever to be monumental. It can be a sudden spear in one's heart or gut, but its insertion can leave a deep wound. Unlike the length of Mariane Pearl's Terroristic spear that had been twisting in her guts since late January, Kwan's Terror was not without its shock, its permeating rush of fear, intimidation and complacency. There can be little question that it raged once Sarah Hughes' scores flashed on the boards, pressing the muzzle of the competitive gun firmly to Kwan's head. Vigilance, however, needs only a thin thread of hope to become a steel cable. Kwan attacked the ice but it was too late. She fell. Her fall was the death of her Gold Medal hopes. She could have just sat there and cried. She could have ripped off her skates and stomped off the ice, a victim of the Terror from ice skating teenagers.. Instead, in Olympic grandeur, she lifted herself up and finished her performance with grace, dignity and beauty. Her recovery attained a stature far greater than Gold in the eyes of those who had followed her career, those who know that a "moment of glory" is not "glory at all," but rather only a brick in a road paved with courage, conviction and action. The legacy of a champion isn't how they win, but how well they recover from a loss. Champions are measured by Vigilance. Mariane Pearl must have fallen hard on the ice when she received the news of her husband's brutal slaying. 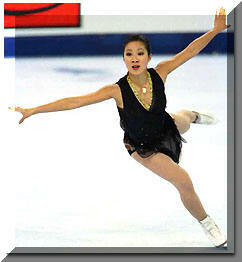 Like Michelle Kwan, her hopes and dreams of her husband's safe return were her Gold Medal. Now, they were gone forever. As I watched the Medal Ceremony where Sarah, Michelle, and Russian skater, Irina Slutskaya received their awards, the gold, silver and bronze respectively, I thought of Mariane Pearl on the platform with them. I saw her standing proud, dignified in the face of what some might call "defeat," but others, who understood the essence of life's struggles, knew that she was standing in the face of "victory." The "victory" Mariane Pearl achieved was cut from the same cloth as that of Michelle Kwan--she never gave up hope, even at the end. She had a Gold Medal despite the horror of her husband's loss. Inside her womb beat the heart Daniel Pearl. His legacy was alive, swimming in the amniotic fluid of life. His genes thrived. His legacy would grow. It would be a legacy of reconciliation--of peace, of a quest for serenity in a world of madness. As a journalist, Danny Pearl's mission was to report the "news". News, in its purest form, is a balance, showing both sides of the coin. A journalist's life, especially that of a Wall Street Journal writer, is about disenfranchising one's personal or political opinions from the facts, and presenting them with equality, reporting the facts not opinions of both the good and bad, the right and wrong so that the reader, not the writer, can make up his or her mind as to which side of the coin they wish to agree. Mariane Pearl's husband put himself in harm's way to give the world a chance to see "both sides." Had the Terrorists recognized his purpose, his mission, his background, his vigilance to report the "purity of the news," they would have laid out the red carpets and sharpened his pencils. He sought fairness in a world of unfairness. He sought balance in the world of imbalance. His words would have given the world another look at the face of Terror, perhaps they would helped bridge the gap between the hatred fomenting between people, and added ultimately to a peaceful resolution to barbarism. Only when we can see each other fairly can negotiations begin that lead to peace, and Danny's words might have added to that vision. But Terrorism blinds itself with hate. It could not see beyond it. Terrorism lost when it killed Danny Pearl. But Vigilance won. Vigilance is ultimately fairness. It requires the courage to face one fears, the conviction to undermine one's intimidations, and actions necessary to shove aside one's complacencies so that one can believe the "attempt is the victory." 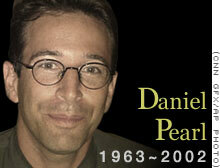 Danny Pearl died in the attempt of reporting the need to know the enemy was not the enemy. For we cannot live long in this world with enemies. If we do, there will never be peace of any lasting value. 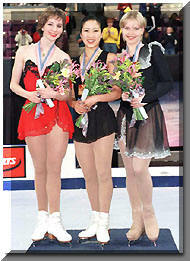 Michelle Kwan's dream did not die because she didn't win the Gold Medal. She left a legacy on the ice of a champion who gets up from a fall and skates despite the Terrorism of not being "perfect." In a like fashion, Mariane Pearl will stand up from her "fall on the ice" and live a life of a champion. She will know that her husband's genes are alive in her child, and that he was an Olympic Champion who walked into the jaws of death and Terror to make this world just a little better for his child and all the other children through his words and his desire for fairness. 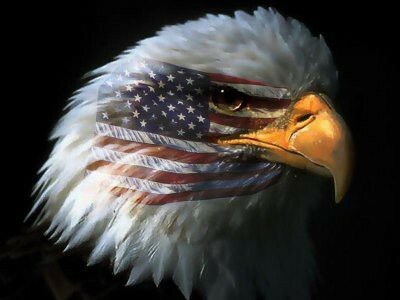 Instead of a gun to her head, she'll wear a Gold Medal around her neck--the one awarded by the Sentinels of Vigilance. Go To Feb. 21--Planting The Seeds Of Life From Death--Vigilance For Life!